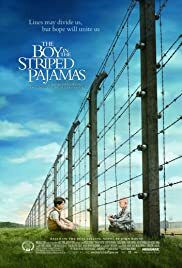 THE REVIEW: There’s a few things about The Boy in the Striped Pajamas that I’m unsure about, but one thing I know for certain: this film packs quite the emotional punch and is just as hard hitting as other Holocaust dramas out there. The film is told from the perspective of eight year-old Bruno (Asa Butterfield) who is the son of Ralf (David Thewlis), a Nazi Officer tasked with overseeing a nearby concentration camp. Viewing things from the German perspective — more specifically an innocent and unwitting German perspective — is unique in that we’re forced to look at the situations differently than from a film like, say, Schindler’s List. Asa Butterfield helps the film succeed by giving us the viewer the perspective of someone who doesn’t know what’s happening around him. Probably everyone who watches this film will know about what happened in concentration camps during the Holocaust and when we see black smoke in the air, we know the horror and cruelty that’s taking place in some unseen location. On the other hand, we see Bruno cooped up inside his family’s home with nothing to do and bored out of his mind because he cannot explore. When Bruno does manage to “escape” and find his way over to the “farm”, he acts like any eight year-old would when he sees fellow eight year-old Shmuel (Jack Scanlon) in “striped pajamas” behind electrified barb-wire fencing: curious and excited. It’s this contrast between knowing what’s actually taking place — forced labor, grueling living conditions, mass executions — and seeing what Bruno sees — harmless fun, everything is just a “game” — that makes this film worth watching. That being said, it’s tone can be a bit too light in certain situations. We’re stuck in this place of innocence for so long that by the end, we cannot fully comprehend the consequences of what happens. The battle that Elsa (Vera Farmiga) fights as Ralf’s wife, who is slowly discovering for herself just how horrible the camps are, could be better developed. Her change from the Jew-hating German, to one who says “Thank you” to Pavel (David Hayman) for bandaging Bruno’s cut, to wanting to move the kids as far away from the concentration camp as possible, is quite drastic and not fully shown in the scenes we see. Bruno steadfastly remains naive all the way until the end which, while quite possible and reasonable for an eight year-old, diminishes the realization the audience can have. THE TAKEAWAY: Despite some of these failed character developments, the ending still takes an emotional toll on you and delivers an experience almost on par with an even darker film. It never gets to quite the level or intensity as a film like Schindler’s List, but it is of the same caliber and a film that is worth watching.